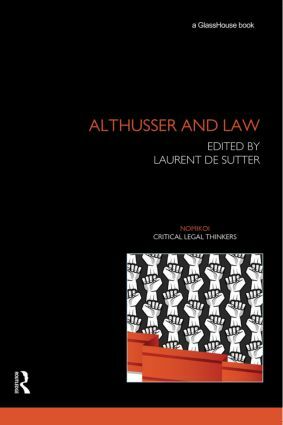 Althusser and Law is the first book specifically dedicated to the place of law in Louis Althusser’s philosophy. The growing importance of Althusser’s philosophy in contemporary debates on the left has - for practical and political, as well theoretical reasons - made a sustained consideration of his conception of law more necessary than ever. As a form of what Althusser called ‘Ideological State Apparatuses’, law is at the forefront of political struggles: from the destruction of Labour Law to the exploitation of Patent Law; from the privatisation of Public Law to the ongoing hegemony of Commercial Law; and from the discourse on Human Rights to the practice of judicial courts. Is Althusser still useful in helping us to understand these struggles? Does he have something to teach us about how law is produced, and how it is used and misused? This collection demonstrates that Althusser’s ideas about law are more important, and more contemporary, than ever. Indeed, the contributors to Althusser and Law argue that Althusser offers a new and invaluable perspective on the place of law in contemporary life. Laurent de Sutter is FWO Senior Researcher in Legal Theory at Vrije Universiteit Brussel, Brussels. He is also Lecturer in Legal Theory at Facultés Universitaires Saint-Louis and Visiting Teacher at Cardozo Law School. Nomikoi: Critical Legal Thinkers presents analyses of key critical theorists who have written on law and contributed significantly to the development of the new interdisciplinary legal studies. Addressing those who have most influenced legal thought and thought about law, the aim of the series is to bring legal scholarship, the social sciences and the humanities into a closer dialogue.